San Francisco's Jeff Ulbrich, a former Hawaii standout, chased Chicago's Danieal Manning during a 74-yard kickoff return. CHICAGO » J.T. O'Sullivan made a perfect case to start. And Alex Smith's counter-argument didn't measure up. Even so, 49ers coach Mike Nolan wasn't ready to announce a starting quarterback. O'Sullivan threw for 126 yards and a touchdown in his limited time while Smith struggled, and the San Francisco 49ers beat the Chicago Bears 37-30 last night. Although the third preseason game usually is a dress rehearsal for the opener, Nolan wouldn't declare a winner in the quarterback race. "We will talk about it more (today)," Nolan said. "I would like to watch the film, talk to our players, before any announcement or anything like that is made. But I did like what I saw in all three of them." After two mediocre outings against Oakland and Green Bay, O'Sullivan couldn't have performed any better against the Bears. He was 7-for-8 with a perfect 158.3 passer rating in his third preseason start. He led the 49ers (2-1 preseason) to field goals on the first two possessions and a two-play, 77-yard touchdown drive on the third one. He hit Vernon Davis with a 40-yard pass and then scrambled to his right before throwing a 37-yard touchdown pass to Jason Hill to give the Niners a 13-10 lead less than a minute into the second quarter. "That was a great play call," O'Sullivan said. "Jason did a great job of running so fast across the field and just made a great play on the ball." And O'Sullivan did a good job, too. The question is whether he did enough to beat Smith, who came on early in the second quarter and was 6-for-17 with 83 yards and a touchdown, even though Nolan wasn't about to make an announcement. He even left the door open for Shaun Hill, who played well late in the game. 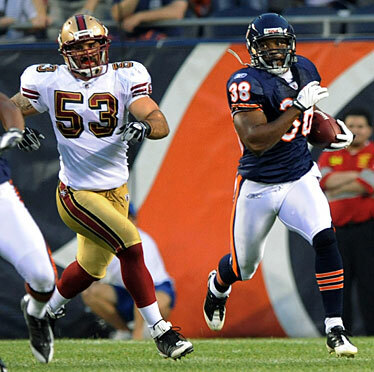 Smith entered the game after Chicago's Garrett Wolfe fumbled the kickoff following Hill's touchdown pass, giving the Niners possession on the Bears' 16. Moran Norris ran it in from the 1 to make it 20-10. Smith also led the Niners on a 62-yard drive that ended with a 12-yard touchdown pass to Dominique Zeigler, giving the 49ers a 27-20 lead with 9:28 left in the third quarter. Otherwise, it was a rough night for him. Hill replaced him late in the third quarter and was 6-for-7 with 60 yards against the Bears' reserves.